I was not aware of Karthigai deepam adai until my MIL told me. She was telling about a milagu jeeraga adai recipe / Pepper adai using raw rice and urad dal she heard from one of her brahmin friends. Actually milagu jeeraga adai/Pepper cumin adai is not new to me. We usually make it with idli rice or steamed rice. 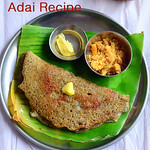 But adai using raw rice and urad dal is something new and interesting to me. After that, when I browsed for Karthigai adai recipe, I found many versions with raw rice, chana dal, toor dal and urad dal just like our orappu adai. Finally I found one authentic recipe from Kaveri’s blog-Palakkad Chamayal. Her recipe was very close to what my MIL told me. So I tried it without any second thought. With the flavor of black urad dal and pepper, cumin, it came out very well with a crispy texture. Sendhil loves pepper based dishes. So he liked this milagu jeeraga adai very much. He told its flavor and taste is very much similar to Anjaneyar Kovil Milagu vadai recipe. 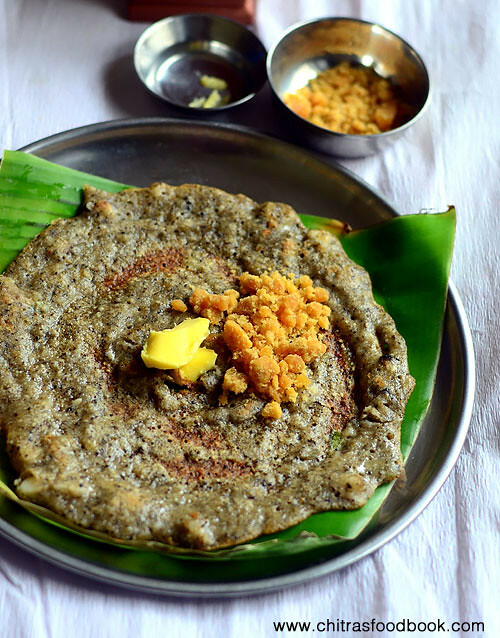 One thing you should remember is that this adai has to be served hot immediately to enjoy its best taste else it will turn hard and chewy when cooled down. While one person cook the adai, the other has to eat it. Grated jaggery and butter is the best side dish for this adai. Friends, do try this brahmin special Karthigai adai recipe for this Karthigai deepam festival and enjoy ! 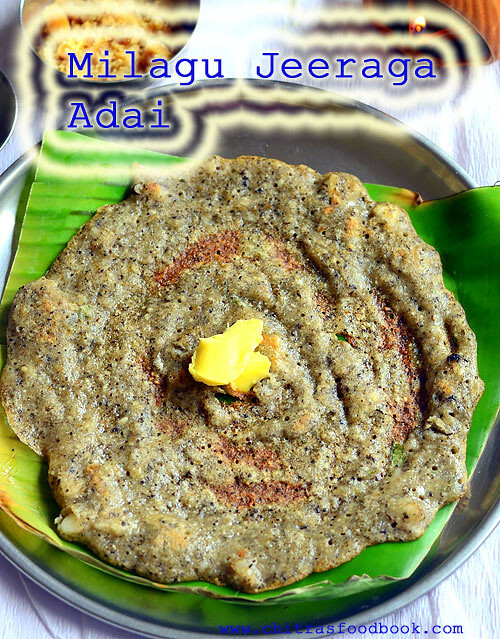 Karthigai adai recipe - Milagu jeeraga adai / Pepper Jeera Adai for Karthigai deepam recipe. Wash and soak raw rice for 2 to 4 hours. In a mixie jar, take the black urad dal, pepper corns, cumin seeds and half of the soaked rice. Grind to a coarse paste like rava adding enough water. Collect in a bowl. Grind the remaining rice to a coarse paste collect in the same bowl. Add coconut pieces, chopped curry leaves. Mix well. Heat dosa pan. Spread the adai batter to make it slightly thick. Drizzle oil or ghee. Cover and cook till golden in medium flame. Flip and cook the other side. Remove and serve hot with jaggery and butter as side dish. Wash and soak raw rice (I used dosa rice) for 2 to 4 hours. After soaking, drain the water and keep aside. In a big sized mixie jar, add black split urad dal, pepper corns, cumin seeds, salt and half of the soaked rice. Grind to a coarse paste like rava adding enough water. Collect the batter in a bowl. Grind the remaining rice to a coarse paste adding water. Add to the same bowl and mix well. Add chopped curry leaves and coconut pieces. Heat a dosa pan. Pour 1.5 ladles of batter and spread it thin or thick as you like. Make a hole in the center. Drizzle 1 tsp oil around it. Cover and cook for sometime. When the bottom turns golden, flip the adai and cook in medium flame till it becomes golden. Remove and serve hot with jaggery and butter ! This adai tastes the best only when served hot. 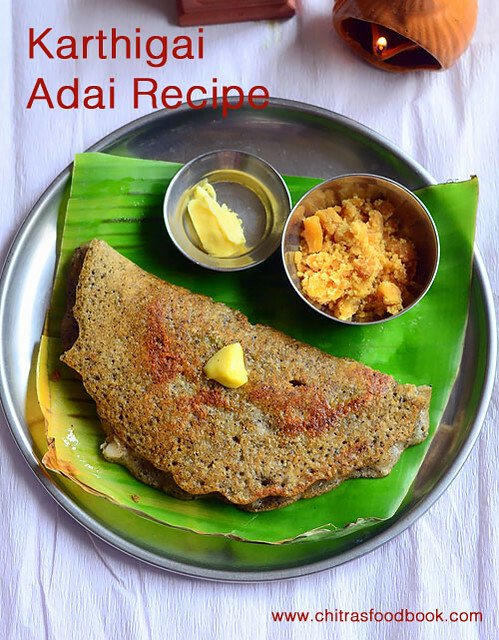 This adai tastes the best only when served hot.So serve immediately after making the adai. It turns hard when warm. For variations, you can add boiled rice/Puzhungal arisi(Saapaattu arisi) instead of raw rice. But you should not use this rice for occasions and festivals if offering God. Adjust the quantity of pepper as per your taste. Try this authentic Karthigai milagu adai recipe and enjoy with jaggery and butter !